Risks are changing and risk management needs to change too. In order to remain relevant and continue to add tangible value to businesses, StrategicRISK believes risk management needs to evolve and change. That’s why it has launched #ChangingRisk – a campaign promoting new thinking in risk. For the next six months, #ChangingRisk will gather the views of the global risk community on how you think risk should evolve to better meet the needs of business. 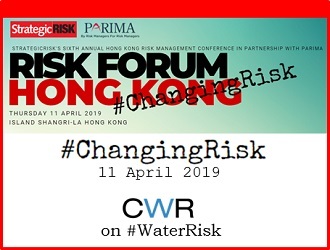 Join them at Risk Forum HK 2019 where they will be sharing the initial findings of the #ChangingRisk and showcasing new thinking in risk management. CWR’s Director Debra Tan will be speaking “Risk pitch: Managing water risk” in the forum at 1:30PM. Attendance to Risk Forum Hong Kong is free of charge for corporate risk and insurance managers, by invitation only. For more info click here.